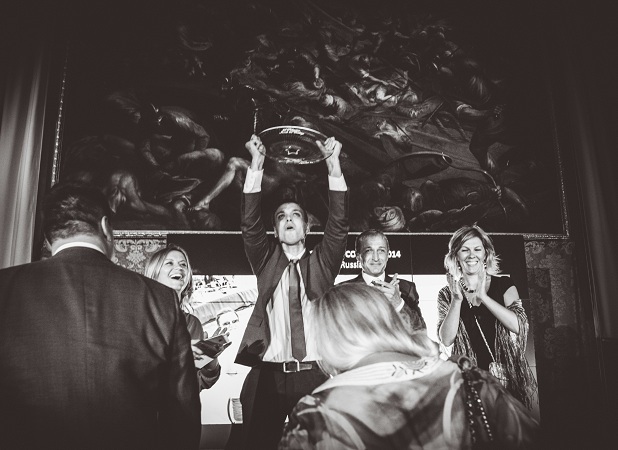 The Russian chef Sergey Berezutskiy is the 2014 Acqua Panna & S.Pellegrino Young Chef of the Year Award winner, shining bright amid some of the most talented emerging chefs of the world. He also won the Inside the Cooking Award. 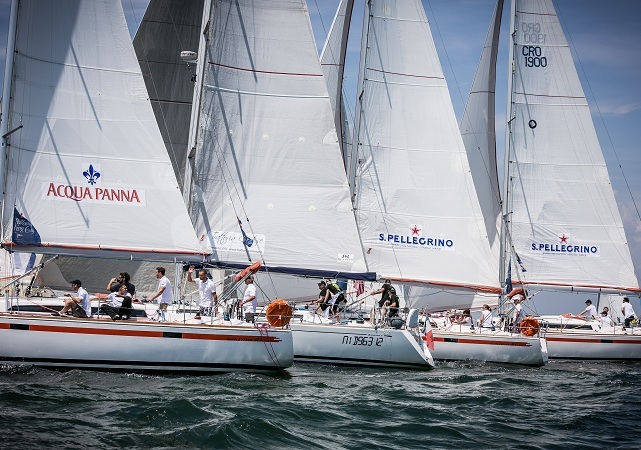 while the boat MisterX 3 won the S.Pellegrino Cooking Cup. 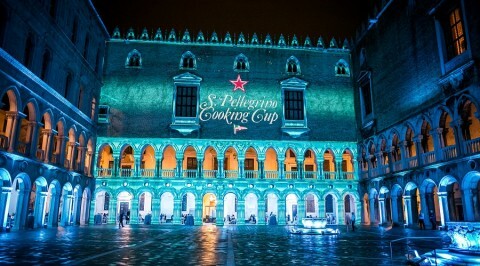 Venice, 14th June 2014 – The 14th edition of the S.Pellegrino Cooking Cup has just come to an end. The spectacular regatta, organized according to tradition in collaboration with the historic Venetian yacht club Compagnia della Vela, once again saw 41 boats competing from the Lido of Venice to the Island of San Giorgio, striving to be the first on the finish line and the best in the galley. The winners’ proclamation finally arrived as the sun went down in the astonishing backdrop of the Venetian Lagoon, at the end of a thrilling day, started off early in the morning at the Rialto outdoor market,where chefs met to hand-pick the ingredients chosen for their recipes. The boat “MisterX 3”, with the chef Karen Boscolo Meneguolo of the resturant El Gato di Chioggia on board, won the S.Pellegrino Cooking Cup trophy. The Inside the Cooking, a real race within the race involving ten boats from S.Pellegrino international markets, each with a young chef onboard, representing Australia, Korea, Belgium, Germany, Israel, Italy, Canada, Russia, the United Arab Emirates and the USA, saw the victory of the Russian boat. These unique awards are assigned basing on a ranking that takes in consideration the boat performance and the chef’s work at the same time. But the true star of this year edition is the chef Sergey Berezutskiy, winner of the Acqua Panna & S.Pellegrino Young Chef of the Year 2014 Award. He captured the attention of the Jury during two key moments with his signature dish Mackerel with watermelon, crispy beetroot “risotto” and the chechil cheese and during the regatta, when he brought aboard the Timoteo the “Two ways”, the langoustines with artichokes smoked in birch bark with zucchini and tomatoes. The second place in the Acqua Panna & S.Pellegrino Young Chef of the Year 2014 Award went to the Belgian chef Thomas Troupin, while The German chef Kirill Kinfelt achieved the third place. Also the coveted People’s Choice Award, assigned by the guests of the inaugural dinner, voting along with renowned gourmet experts, has been assigned to Thomas Troupin and his Egg 63°C, creamy brown butter emulsion, sherry & porcini mushrooms cream, lardo di colonnata. “I was not expecting to receive such award – he commented – and I am very proud because I am working really hard to promote Belgian cuisine and its local products around the world, for example with the project Generation W. For sure this recognition will give a contribution to elevate the awareness of our cuisine”. Last but not least, the brand new Critics’ Choice Award, assigned by a Jury of journalists, a S.Pellegrino Cooking Cup 2014 novelty, went to the Israeli chef Ahmad Salameh, who presented his Black garlic cannelloni filled with duck, that commented “I am so glad for this award. I lived an incredible experience here and for sure this will help me to go a step forward towards my dream of opening a fine dining restaurant”. With the success of this 14th edition of the Cooking Cup, S.Pellegrino and Acqua Panna, synonymous with the gourmet food and wine culture across the globe, proved once more their commitment to scouting and promoting emerging talents and reaffirmed their role of true ambassadors of the Italian style and art of living all over the world.